The extra-large, state-of-the art operator’s station on the RT210 GEN:3 Track Loader is designed for optimal operator comfort resulting in more productivity. Controls on the RT210 GEN:3 Compact Track Loaders are ergonomically designed to reduce operator fatigue, increase productivity and improve versatility. Optional electronic attachment control – 14-pin connector that allows operation of all attachments. Hydraloc™system applies the parking brake whenever the operator raises the restraint bars, leaves the operator’s seat, open the door or switches off the ignition. The RT210 GEN:3 engine is packed with plenty of low-end torque, just what a track loader needs to power through the toughest jobs. 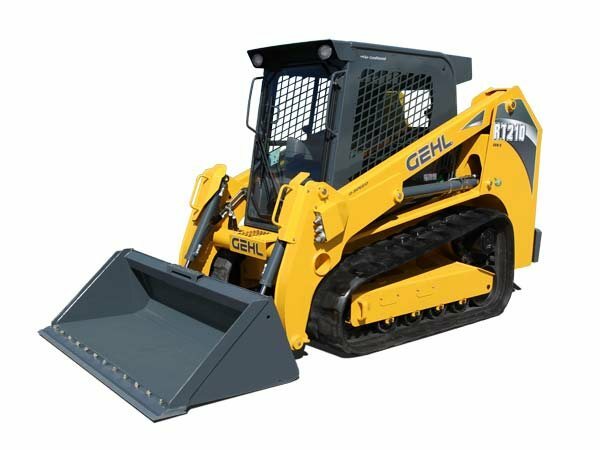 The RT210 GEN:3 Compact Track Loader hydraulic system is engineered to push more material, lift heavier loads and power demanding attachments. Electro-hydraulic controlled hydrostatic transmission with direct engine coupling provides high operating efficiency while AntiStall technology keeps the power flowing. The RT210 GEN:3 Compact Track Loader is available with your choice of two attachment mounting systems designed to enhance jobsite efficiency. The robust lift-arm on the RT210 GEN:2 Compact Track Loader is designed for optimal strength, visibility and capacity. Simple “in-line” design increases structural integrity by eliminating the complex geometry and welding found on many competitive “offset” lift arm designs. Serviceability is very important to our customers. The RT210 GEN:3 is sure to exceed your service expectations. Operating Capacity at 35% Tipping Load 2,100 lbs. Operating Capacity at 50% Tipping Load 3,000 lbs. Drawbar Pull/Tractive Effort 11,489 lbs. Bucket Breakout – Tilt Cylinder 6,631 lbs. Bucket Breakout – Lift Cylinder 6,481 lbs.